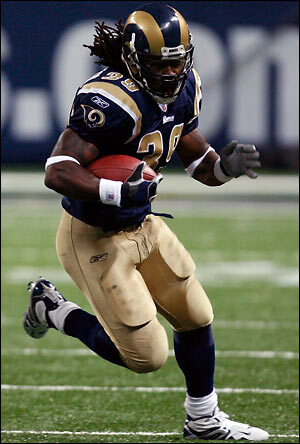 Steven Jackson is a running back for the St. Louis Rams picked 24th overall in the 2004 NFL draft. Jackson was last year’s consensus #2 pick, but injuries kept him out of action for 6-8 weeks, probably killing the season of most owners that took him. Despite that, Jackson’s relatively strong 2007 finish combined with his league-best finish the year before (just in time for the fantasy playoffs, where he single-handedly won many leagues) means that Jackson is likely to remain in the 4th or 5th overall spot. Part of the hype coming into the 2007 NFL season was how strong Steven Jackson finished the ’06 season. Though LaDainian Tomlinson set touchdown records that year, he was resting the last few weeks of the season (after he had broken the record) and Steven Jackson had a better fantasy playoffs. Owners remember when a guy almost single-handedly won them a fantasy trophy. They want to reproduce that, and therefore Steven Jackson was highly coveted coming into 2007 drafts. This year, there are other, trendier picks, and you can expect to get Steven Jackson a little further down the draft board. If he’s healthy — and that’s always the caveat with NFL running backs — Jackson could be a huge value in the middle of first round of fantasy football drafts in 2008. Jackson attended Oregon State University and played 3 seasons each of which he was putting up excellent numbers. During his sophomore year he led the Pac 10 in rushing and was eighth nationally with 1,690 yards with an average of 130 yards per game. He left with one year remaining of eligibility to become the first Beaver to enter the NFL draft with eligibility left. In the 2004 draft, Steven Jackson was overlooked by several teams due almost exclusively to the knee injury he suffered in his last year at Oregon. Jackson had surgery on the knee after the college season, but never fully rehabbed it. The knee had to have clean up surgery after Jackson�s rookie NFL season, prompting some to believe his rookie season was hampered by the nagging injury. Despite him playing second fiddle to Marshall Faulk and the injury he was still able to rush for 673 yards with 189 reception yards and four touchdowns. His second year he usurped Faulk as the number one and rushed for 1,046 yards and eight touchdowns. His breakout season though came in 2006 when head coach Mike Martz was replaced with Scott Linehan. Under his hand the Rams offensive attack was more balanced and Jackson profited by rushing for 1,528 yards 13 touchdowns and received 90 passes for 806 yards. His 2007 year was somewhat of a disappointment for Jackson as he was out of four games and played injured in several others. The games he did play he was virtuously without his entire offensive line. This year sees offensive coordinator Al Saunders come in. One of the first statements of his was that Jackson should be what the entire offence is built around. Speaking of the offense though, sorry to say, they probably won�t be very good. So you could potentially get a stud at a much lower price this year than the previous one. And yea, there isn�t really anybody to challenge him for his position so he will be doing most of the carrying. Hopefully for the sake of Jackson the injuries he has had are the freak kind and not a pattern that could see him slowing with each progressive injury. Obviously we have no idea how the 436 touches last year will affect him in the upcoming season, but his running style does invite some serious contact. Any injury to him would be a major setback, but injuries to others around him; in particular his offensive line could have adverse affects on his game as well. If I had a crystal ball, and I don�t, but if I did I think the scene would play out more closely to his 2006 season rather than the 2007 one. I don�t expect the season he had two years ago because those only come around every so often, but it most likely will be a big numbers year for him. Despite the injuries he sustained he still was outstanding in the games he did play. Can he overcome an aging offensive line and an aging passing game? Maybe or maybe not, but end the end you just want him to run his socks off. Steven Jackson is in a Rams offense that floundered last year, but still has a whole lot of talent (Torry Holt, Marc Bulger). The bad offense last year was affected by the injuries to Stephen Jackson and Marc Bulger, as well as injuries to all five starting offensive linemen. As always, injuries will play a huge role in Jackson’s numbers, but he’s still got a lot more upside than most other runners on the fantasy draft board. Remember that Jackson has been dinged every year besides 2006, though that’s the way with most runners. He’s a big back who catches lots of balls and scores a lot of touchdowns. Rams head coach Scott Linehan is facing a make-or-break year. There were suggestions that Linehan would be fired during the St. Louis Rams bye week last year, so he is on a short leash and could lose his job mid-season if things go south quick. That means Linehan is likely to lean on his star players early and often, hoping they can start the season on a hot streak. I expect to see Steven Jackson get a huge number of carries this year, especially in the early part of the season. If Jackson’s body can hold up to the pounding — and that’s a large if given his NFL and college career — Jackson should have a huge fantasy season.